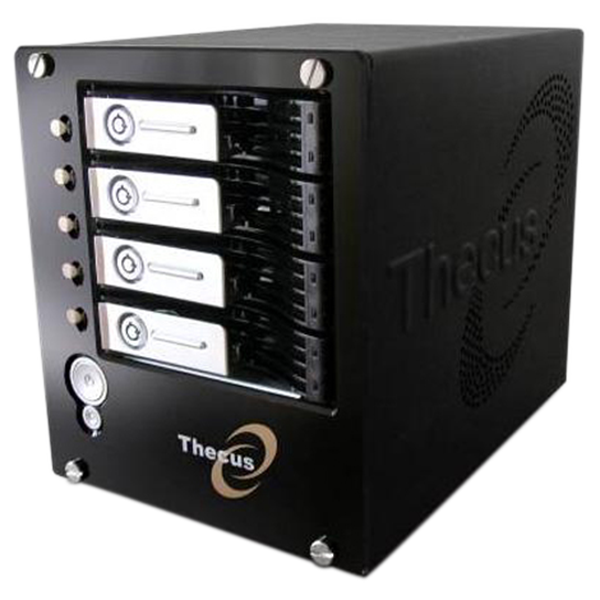 The original N4100 is the 4-bay Thecus NAS device that started it all. Renowned for exceptional performance and features, the introduction of the N4100 set a new standard for what people have come to expect from a NAS device. Today, Thecus Technology is proud to announce the N4100+, a completely updated version of the N4100 that delivers the latest Thecus innovations and functionality. Extend the functionality of the N4100+ with a variety of homebrew applications. The N4100+ supports third-party modules with just a few mouse clicks – a unique feature only from Thecus. The N4100+ comes with highly configurable power options, allowing you to schedule on/off times, and even schedule your hard disks to spin down for lower total cost of ownership. Why confine your media to one PC? Let it out with the 4100+'s DLNA-certified media server. Connect easily to DLNA certified digital media adapters and devices for easy network media streaming. And with its built-in iTunes® Server, you can enjoy your favorite music from any iTunes-compatible device on your network. Optimize your bandwidth usage with the N4100+'s Download Scheduler. Finish BT, HTTP, or FTP downloads during off-peak hours for full access to your bandwidth at times when you need it most. What's more, you no longer have to leave your PC on, which means even greater cost savings. With its built-in USB ports, the N4100+ can support USB wireless dongles for easy wireless access to your data. USB printers and USB storage devices are supported as well for unmatched flexibility. 05/11/2007 – The original N4100 is the 4-bay Thecus NAS device that started it all. Renowned for exceptional performance and features, the introduction of the N4100 set a new standard for what people have come to expect from a NAS device. Today, Thecus Technology is proud to announce the N4100+, a completely updated version of the N4100 that delivers the latest Thecus innovations and functionality. The N4100+ is powered by a 600MHz Intel® 80219 CPU for exceptional data-processing capabilities. Its four hard drive bays accommodate four 3.5” SATA hard disks for up to 4TB of storage. RAID modes including RAID 0, 1, 5, and JBOD allows N4100+ users to select the level of data protection they want while optimizing performance. RAID management features such as auto rebuild, hot swap, and hot spare ensure minimal downtime, while two Gigabit Ethernet ports ensure that users can get at their data quickly. Small-to-medium businesses will love the N4100+. In addition to its RAID capabilities, the N4100+ also allows users to remotely access their files via FTP or its web-based interface. Multiple OS support makes it easy to integrate the N4100+ into virtually any network, and a 30% power savings mean a lower total cost of ownership when compared to a full PC. To ensure proper data backup, the N4100+ comes not only with the Thecus Backup Utility, but also Nsync, an application that enables users to have the N4100 automatically upload files to an external storage device at a designated time. Designed for SMBs to enhance data security, Nsync takes the guesswork out of data backup. <?xml:namespace prefix = v />Users at home will also find the N4100+ extremely handy. The N4100+ comes with Mediabolic Media Server, which will allow N4100+ work with DLNA Certified media players. Its built-in iTunes® Server allows users to stream their entire music libraries throughout their homes, while the Download Manager enables BT, HTTP, and FTP downloading during off-peak hours – all without a PC! The Print Server shares a single printer with every PC on the network, and third-party module support lets users extend the functionality of their N4100+ even further. Farstone DriveCloneTM PRO Support system disaster recovery on your Windows 2000, XP and Vista systems. ISO Mount Support mounting ISO files as a share folder for easy access ISO image contents. *PDC/AD support: Works as a client member in an Microsoft NT 4.0 domain/Active Directory domain, allowing the N4100+ to utilize the domain users and groups setting for authentication to the system and authorization to the share folders.